Which consists of a single court in the capital Baghdad and it is considered as the highest judicial body in the ordinary judiciary, and it currently consists of a chief and (26) judges, and it is competent in reviewing the decisions issued in all criminal, civil and family courts, it’s chief is the Chief of the Supreme Judicial Council and Vice-Chief of the Court is Vice-Chief of the Supreme Judicial Council. Shall replace the Chief of the Court of Cassation and the Chief of the Supreme Judicial Council in their absence for any reason. Based in Baghdad, headed by the head of public prosecution and followed by public prosecutors present in all courts in Iraq (the task of public prosecution is to monitor the decisions that are issued by judges and the represent the society), the head of public prosecution is a member of the Supreme Judicial Council. Is the responsible body of monitoring the conduct of the judges and the staff in all the courts of Iraq. (Except for the Constitutional Court and the courts of the Kurdistan region) and the chief of the judges commission is a member In the Supreme Judicial Council. Is the highest judicial and administrative body in Iraq, and there is a court in each of the (15) provinces of Iraq except for Baghdad which has two making it (16) courts of appeal in total In Iraq (except for the provinces of Kurdistan, because of the independent judicial system in the region). The Head of the court is considered to be the head of justice in the province and a member of the Supreme Judicial Council. 1. Has a bachelor degree in law (studied law for 4 years). 2. Has a minimum of 3 years’ experience in the legal work (Lawyer, Investigator or Employee) after acquiring the Bachelor degree. 3. Apply to study at the judicial institute (The applicant get accepted after passing an oral and written exams). 4. The period of study at the Judicial Institute is two years in which he/she gets theoretical and practical lectures and practical applications on a daily basis under the supervision of judges from various jurisdictions. 5. After the graduation he/she shall be appointed as a judge or a deputy prosecutor of a (4th) rank. 6. There are four ranks of judges and deputy prosecutors. 7. The transition between each of the ranks (4th to 3rd), (3rd to 2nd) or (2nd to 1st) needs a period of 5 years, during which the judge have to discus and research in a specific legal subject. 8. When the judge is in the 1st rank he should be eligible to be appointed in more advanced positions like a member of Cassation or the Chief of an Appeals Court. 9. The retirement age of a judge in general is 63 years. Which can be extended at his/her request with the approval of the Supreme Judicial Council to 66 years. As for the judge of the Court of Cassation, the extension period can be up to (68) years. 10. 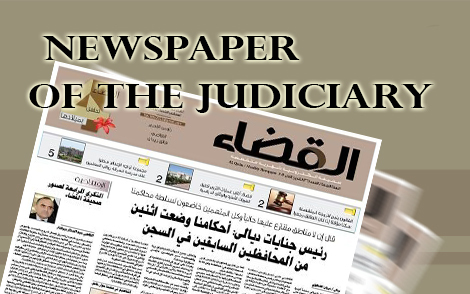 The Chief of the Court of Cassation can be appointed by a nomination from the Supreme Judicial Council by voting, on the condition that he should obtain the position of Vice-Chief of the Court of Cassation and serves for two years in this position. The candidate should be sent to the House of Representatives to vote for the approval of his appointment. If approved, the Chief will issue a decree of this appointment. There is no limited term or period for this position yet it falls under the legal retirement age of (63) years old and it can be extended up to (68) years old under his/her request and the approval of the Supreme Court (the chief of the court of the cassation becomes automatically the chief of the supreme court, that’s because the law states that the chief of the supreme court is the chief of the court of cassation). 11. The member of the court of cassation, the chief of the public prosecution and the chief of the Judicial Supervisory Authority should be appointed in the same manner as the chief of the court of cassation. As for the vice chief of the court of cassation, he/she gets nominated by the Supreme Court to be the chief of the republic and the presidential decree is issued by his appointment. 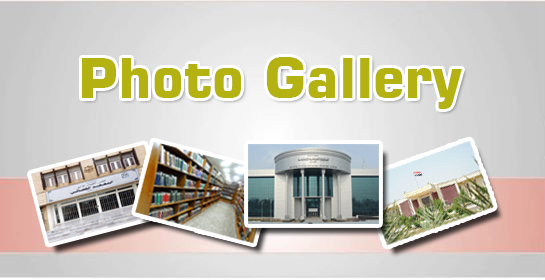 Represented by the Federal Court, which only has one based, in the capital city of Baghdad. And it consists of a chiefand (8) members, its jurisdictions are limited to the constitutional issues and it is completely independent of the ordinary judiciary and there is no link between them. The Council of State is specialized with the functions of the Administrative judiciary and it’s considered as an Independent body that is not linked to any other party, and it includes the Administrative judiciary, Staff Courts and the Supreme Administrative Court. The military councils are specialized with this kind of jurisdictions which belongs to the ministry of defense. It consists of military officers that are certified with a law degree in the military crimes. And its jurisdiction over offenses committed by the military in connection with its military function. Belongs to the internal security forces that belongs to the Ministry of Interior. And it consists of Police officers that are certified with a law degree in the offenses that are committed by any member of the police which is related to his job. It consists of all members of the court (currently , they are 27 including the Chief and Vice-Chief). It is hold once at the end of the month and chaired by the chief or the vice-chief in order to examine the important cases that the chief decides to be examined by the general panel. 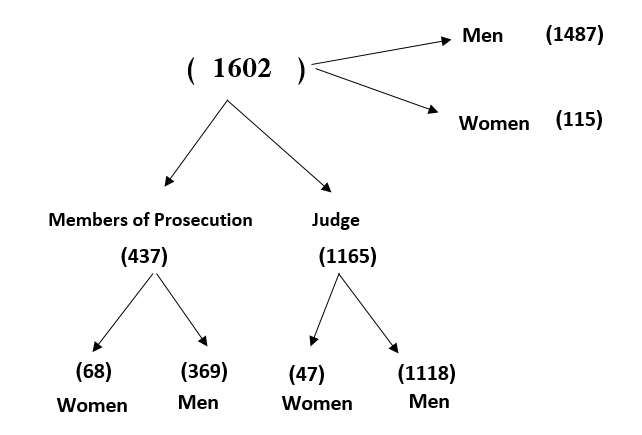 It consists of the largest part of the members of the court provided that they are not less than (15) members. It is held and chaired by the chief or the vice-chief of the court and it is competent in examining the death sentences cases or the criminal cases that the chief decides to be examined by this commission. It consists of a number of members of the court provided that they are not less than (7) and it is competent in examining the important civil cases or the cases that the chief decides to be examined by this commission. It consists of a number of members of the court ,are not less than (5) and it is competent in examining cases punished for by life imprisonment or less. it consists of a number of judges of the court are no less than (3) and it is competent in examining the decisions of the Personal Status Courts (Family Courts). There is one court of appeal in each province except province of Baghdad, which has two courts of appeal: one in the east of Tigris River (Al-Resafaa) and the second one is in the west of Tigris- River (Al-Karkh). So, the total number of appeal` courts in the fifteen provinces is sixteen except the region of Kurdistan. The appeal court is specialize in viewing the civil claims and criminal claims, that the penalty is less than 5 years. It consisted of three Judges for the civil cases and three Judges for the criminal cases. It could be available more than one commission based on the need and nature of work in that province. The verdicts of appeal court should be viewed by court of cassation, and the criminal cases that its punish is 5 years or less, their verdicts are final. Each courts in the province are related to the appeals court according to the clarification in the 3rd to 9th paragraph. It is specialized in civil cases (selling ,buying ,renting, civil commitments, commercial contracts).This court is consisted of one Judge. 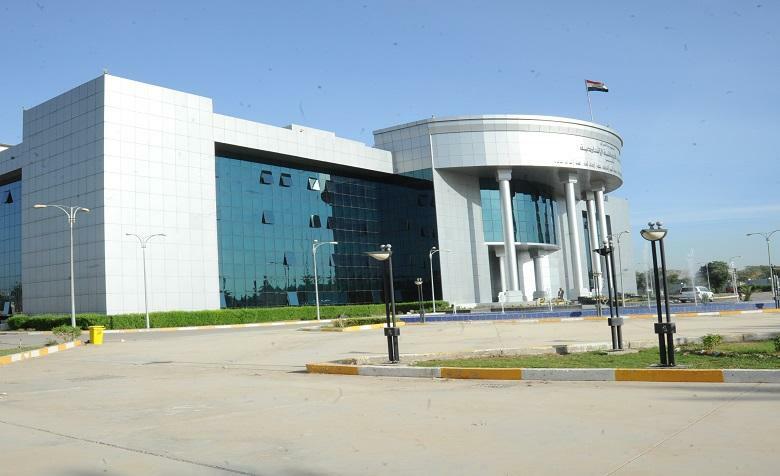 There are many courts of such kind in different Iraqi cities, and all issued verdicts should be viewed by the court of appeal at first and then by court of cassation. It consists of one Judge and specialized in marriage, divorce, expenses , family cases in general. It could be found in the cities of the province, the verdicts will be viewed by court of cassation and court of appeal based on the nature of verdicts. It consisted of one Judge and one attorney and specialized to do investigation in all crimes that its punish would be (over 5 years) and the crimes misdemeanors that it punishes for (5 years or less), and the crimes of violation that its punish would from (24 hours to 3 months). In general , this court is working on the cases presented by police stations that are related to the ministry of Interior in each city of the province. The Judge has the right after completing the process of investigation to send the case to the court misdemeanors (5 years or less) ,or to the court of criminals (more than 5years) based on the type of crime and its penalty or close the case when there were no evidences. The decision issued by the court of investigation should be viewed by the court of criminal in the province. There is one court in each province that is consisted of three Judges and one attorney. It I specialized in the cases that their penalties are more than five years , and its verdicts should be viewed by the court of Cassation. It consisted of one judge and one attorney member, and could be found in each city of the province. It is specialized to investigate in all crimes that its punish would be (5 years or less), the verdicts will be viewed by court of cassation in the province. It consisted of one president and three members, and the president should a specialized Judge in minors and the members are not Judges. It concerns for those who did a crime less than 18, and all issued verdicts viewed by the court of Cassation. In every court there is a court of labor and it is consisted of one Judge and two representing labors and they are not Judges. It specialized with cases concerning with labors. The prosecutor is representing the society. The main role of prosecutor can appear in criminal cases, the member of prosecutor works with all courts of criminal ,and his duty is to monitor and viewing all the verdicts that issued from assize court. For example , the prosecutor member is viewing the verdict that issued by the investigating Judge, if he finds that is according of law he will approve it ,otherwise he will not and appeals the verdict before the assize court in that province, and this court may be authenticate on the Judge's verdict or agree with prosecutor's member or disprove the verdict. The prosecutor's member also has the right to appeal before of the court of appeal in the province, and prosecutor's member also can appeal the verdict before the court of assize before the court of cassation. The presidency of prosecutor general (Its location inside the supreme Judicial council) view the already issued verdicts of executions or life time jail, and prepare a recommendation of theses verdicts to the court of Cassation that may be agree with the request of the presidency of Prosecutor general or agrees with the court based on the law and the evidences in the claim. The penalty of execution and life time jail issued by the court of assize against terrorism crimes. The procedures of investigating, Trial and veieng the terrorism crimes are the same in any regular crime. The first procedures of investigation start by the investigating officeros that belong to the ministry of Interior. The police office presents the case to the investigating Judge in the city the terrorism crime was happened or any other crime. The process of investigation will continue by the investigating officer under the supervision of the investigating Judge and the prosecutor member who works with the investigating Judge. The statement of the criminal will be taken first by the investigating officer and then taken to the Investigation judge with the presence of the prosecutor and a lawyer assigned y the court. If the Judge found that there are no enough evidence he will close the case or if he found sufficient evidences he will send the case to the court of assize and issuing verdict in public. If the assize court found that the evidences are sufficient it will issue the verdict and proper penalty based on the nature of the crime that committed by the criminal or finding him not guilty, release the accused and close the case. In case that the misdemeanor court issued a verdict of execution or life time jail, it is committed to send the case to the presidency of Prosecutor based on the law in the supreme Judicial council to be viewed. The court must send the claims to the presidency of prosecutor in case the accused agreed or refused the verdict. By the way , the period of appealing the verdict is 30 days since the second day of issuing that verdict. After reaching the case to the presidency of the Prosecutor general ,the case should be viewed by all Judges who are working at the presidency prosecutor general, and every Judge has to present his opinion through voting to the Court of Cassation by agreeing on the Court's verdict or disprove the verdict of the court. Now, the role of expanded criminal commission in the court of Cassation (It includes most of the court of cassation's members), that the Judges will view all the execution verdicts within 3 months, and at the end of the month the president of the court of cassation will hold a meeting to discuss the issued verdict by the court and the request of the prosecutor general ,and after the discussion the voting will be made to agree with the verdict or disprove or amend it. If the case was execution and the court of cassation agreed with that ,the claims and verdict papers will be sent to the President of the public to issue a decree and carry out the penalty of execution. After issuing the republic decree should be sent to ministry of Justice to determine a specific day for carrying out the execution penalty. -Criminal :Its penalty execution or life time jail or spending 20 years in Jail or temporary jail for 5 years. -Misdemeanor :Its penalty 3 month in jail to 5 years or paying a fine. -Violation :Its penalty from 24 hours to 3 months or paying fine.